Hello, hello! I hope you had a great Christmas and a very happy New Year’s celebration! How are you finding January so far?! Well, it is cold and wet here in Vicenza, but the Christmas festivities are still going strong. In fact, Christmas will officially end in Italy tomorrow – 6th January – with the celebration of Epiphany. Italian children are also impatiently looking forward to tomorrow, as they are hoping to find by their beds in the morning a stocking full of sweets delivered by Befana – a good witch remnant of pagan times who has successfully integrated herself with the local Christmas traditions. As such, I am still firmly on Christmas wave and feeling like every day is Sunday. Of course, this will come to an end on Thursday, but until then I am full of Christmas cheer and memories of the past two weeks. We spent the Christmas season in England. For almost a year we had been planning to spend this Christmas entirely in Italy, but then life doesn’t always work according to one’s plans. So, we traveled from the splendour of the compact but very elegant Venice Marco Polo airport to the gritty reality of London Luton on 21st December where we were met by extensive refurbishment works coupled with intense rain which drenched us within a minute or two. What followed was one of the most poignant Christmases of my life where magical moments were tinged with sadness and where I could see beyond the cheerful commercial veneer of Christmas and powerfully feel its true meaning – that of a family coming together to love and support one another. So, as an introduction to my new blogging year, I want to share with you ten short Christmas stories – little events which made an impression on me over the past couple of weeks. Some of them seem rather simple, to the point of being, perhaps, banal. Others have a deep personal meaning, which is quite difficult to express with the right words. Yet, each of these ten stories is important to me, as they represent the moments of joy and sorrow, the moments of feeling thankful, being aware of beauty and achieving a better understanding of human nature that I lived through during Christmas 2015. Merry Christmas and a Very Happy and Successful New Year Ahead! You know those moments when you know that you are witnessing something really special and then, by pure chance, stroke of luck or, if you so wish, divine intervention, you end up actually being part of it?! It was Christmas Eve and we were in the majestic St. Albans’ Cathedral. We were told earlier that morning that in the afternoon a Crib Service is held especially for families. Apparently, as part of the service the Nativity figures are brought to the altar and a Crib is assembled. Not being overly religious, but wanting to create a lovely Christmas memory for our little daughter, we reached the Cathedral exactly at 2:25 pm with five minutes to spare to the start of the service. The Cathedral’s nave – the longest in England – was heaving with a merry crowd tightly packed on all available benches. We didn’t have a choice, but to search for a place further away, finally finding two still free chairs at the back of the cross intersection of the Cathedral. Right in front of us stood the figures of the ‘Knitivity’ – a Nativity scene which had been hand knitted a few years back by volunteers. I had always thought of the Knitivity and its figures as a bit wonky. As we passed by them though, my little daughter stopped and gave each of the figures a hug. Some of them – like Mary in her blue dress – were towering over her, whilst others – like Baby Jesus in his knitted manger – were not bigger than a doll. Yet, she hugged every one of them, reveling in their softness. 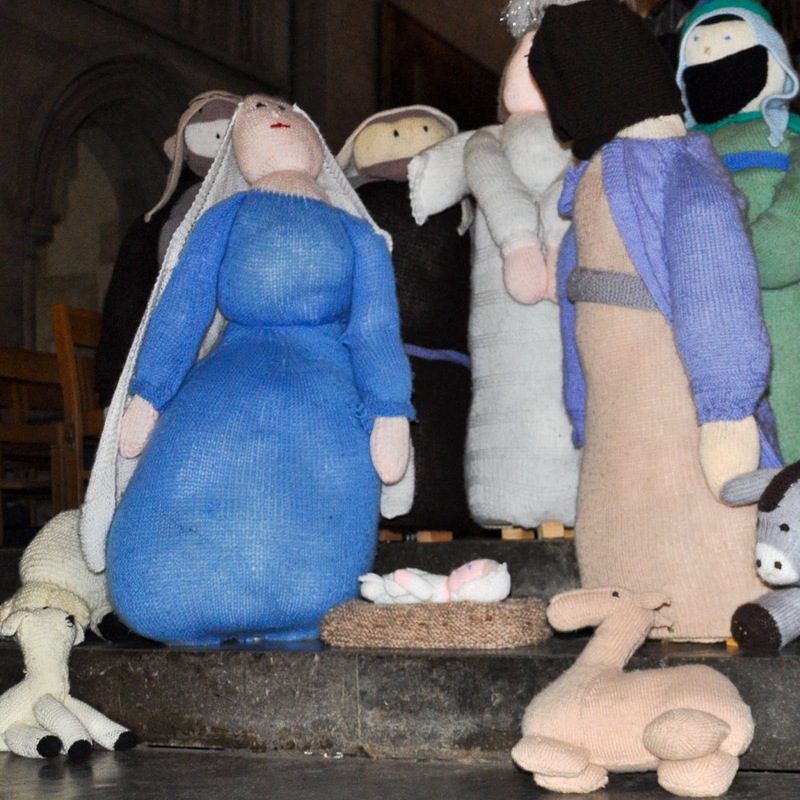 I noticed the glance of a lady holding a clipboard – one of the Cathedral’s volunteers – and, afraid that we were about to be told off for touching the Knitivity scene, I tried to pull my little daughter away in the direction of our seats, but she didn’t budge until she had cuddled all of the figures. Then the service started. It was a joyous affair with the sermon told to be understood by children and adults alike. The congregation sang Carols and hymns and at one point we were even given glow sticks to activate right when the lights on the big Christmas tree were lit, too. Most importantly, at regular intervals during the service, a group of children would come where we were seated at the back and, guided by the same volunteer, would carry the figures of the Knitivity to the front assembling the crib. It was the turn of the last group of figures to make their way. The Three Kings were lifted off the floor by three children. A fourth child took in his hands a large hand knitted camel. And then, there was another camel – a much smaller one – and there was no-one to carry it to the front. Just then the lady volunteer who had been looking after the children, looked at us and asked if my little daughter would like to carry the small camel to the front. It was such a small spontaneous thing, but it really touched me. My little daughter cuddled the knitted camel and followed the other children to the front, where she put it at the right place completing the Nativity scene. With St. Albans Cathedral having such a special place in the hearts of my husband’s family, it was such a lovely meaningful thing for our little daughter to take part, albeit so small and completely unprepared, in the festive proceedings. I felt it was so very special, my Christmas miracle, and it is still my favourite memory of the time we spent in England over the holidays. Oh, I had completely forgotten how intense and soul-crushing traffic in England can be. Endless queues, heavy traffic jams, being stuck in your car for hours on the same patch of tarmac – it all came flooding back. ‘Why, oh why traffic is so slow? !’, we asked ourselves many times, sat in yet another slowly moving car line. Is it because cities and towns in England are so spread out with their individual houses rather than blocks of flats that everybody needs to travel much longer to reach their place of work? Is it because people can’t find jobs nearby and have to commute for hours from one city to the next? Is it because drivers in England are intrinsically very polite and would not cut in front of you or ignore you at roundabouts like the Italians love to do? Is it because lots of people don’t seem to use a GPS and get all stuck together on the M25? In the end, we would grow tired of all these questions and would just want to get out of there as fast as possible. The worst thing was when we got stuck on the M25 on our way to the Isle of Wight right after Boxing Day. We had to make it to Portsmouth for the ferry at 2:30 pm, yet we had spent an hour just making it outside of St. Albans. Google Maps insisted we stay on the highway. All I could see ahead of us was red – a dense curtain of flashing taillights. With only an hour and a half left, I opened the Maps app on my Blackberry. Thankfully, it promised to get us to the ferry port within 90 minutes as long as we got off the highway. Which we did and then the app took us on a round trip via Slough (depressing), Windsor (majestic) and Ascot (impressive) and several other quintessential English villages. We managed to reach Portsmouth fifteen minutes after the ferry was supposed to have left the port. With a restricted ferry service on that day, we were steeling ourselves to be told that we would have to wait at least an hour or two or three before they could bundle us on a ferry going across the Solent. So, imagine our delight, when we found out that our ferry had been delayed by half an hour due to choppy waters, so we made it on board right on time. We had never cheered louder, I guarantee you that! 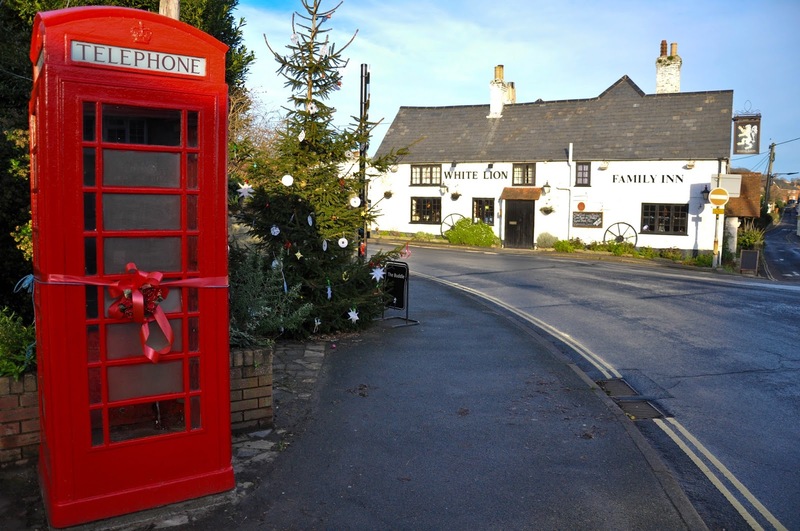 I have always loved Christmas in England, not least because of the very creative decorations lavished on houses and the most unorthodox of places all over towns and villages. 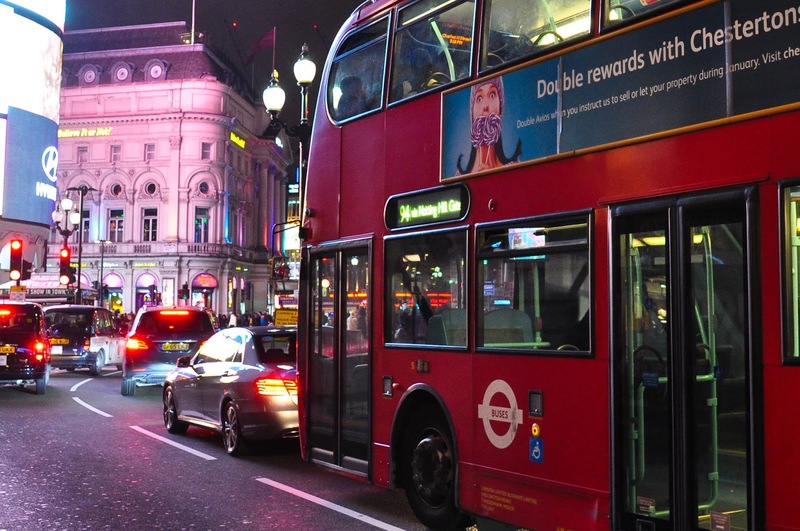 I remember, right before my first English Christmas back in the year 2000, I spent a day in Richmond – a lovely suburb of London – and how much I admired the tall richly decorated Christmas trees strategically positioned in the large bay windows of the mansions there. But Christmas decorations are not limited to just the inside of the houses in England. Gardens are decked with flashing Christmas lights. Trees are adorned with huge baubles and front doors are dressed with beautiful wreaths. 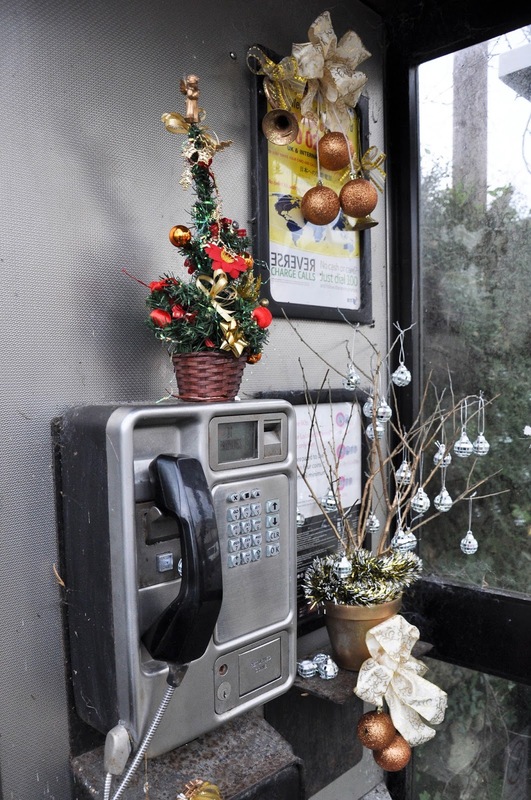 The small village of Niton on the Isle of Wight – one of my most favourite places in the UK – really pushed the creative envelope this year adorning not just the usual suspects – Christmas trees, doors, windows and garden bushes – but even the public telephone booths. It created a lovely festive atmosphere in the village and emphasised its community spirit. 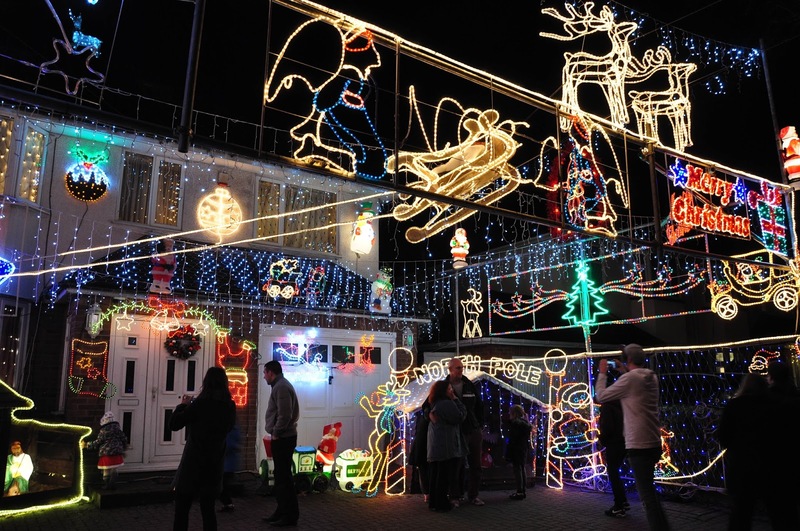 There is a very special house in St. Albans in England which takes decorating for Christmas to a whole new level. For several decades now, each festive season this house gets completely covered in Christmas lights and displays. Every year something new is added and the house – sitting at the end of a long terrace on a long downward street – is a sight to behold. There is a huge Nativity scene, a huge Santa’s grotto, a Santa’s train, a large snowman, as well as countless of light displays shaped like Christmas trees, reindeer, shooting stars and anything and everything else you can think of in relation to Christmas. Angels sit on the roof and Santa’s sleigh is just about to take off. People come every year from all over town and further afield to see the lights, take pictures and simply enjoy the festive music which is streamed through a high-speaker ingeniously masked as a pebble on the floor. It is all done for charity and a donation box stands humbly in a corner of the dazzling display. The collected money is passed to the Cancer ward at the local Mount Vernon Hospital. 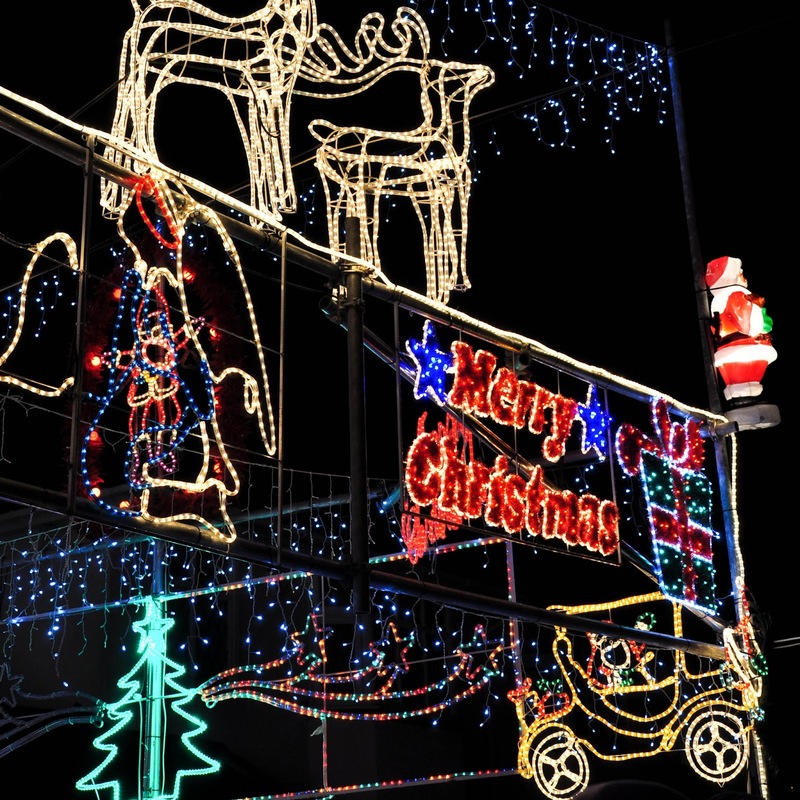 The House of Christmas (at least, this is the name I have given it in my mind) is a St. Albans’s institution, so if you are in the area during the festive season in the years to come, make sure that you add it to your to-see list. 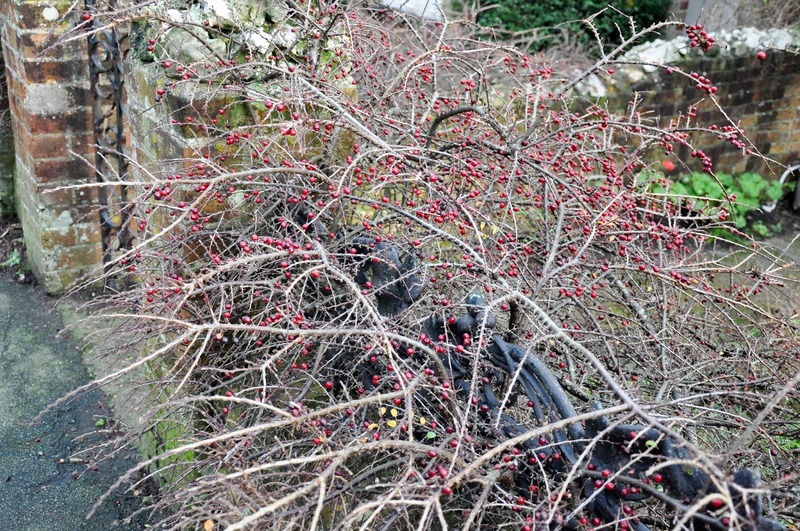 Christmas berries, haws and other red fruits make English front yards so cheerful at Christmas. 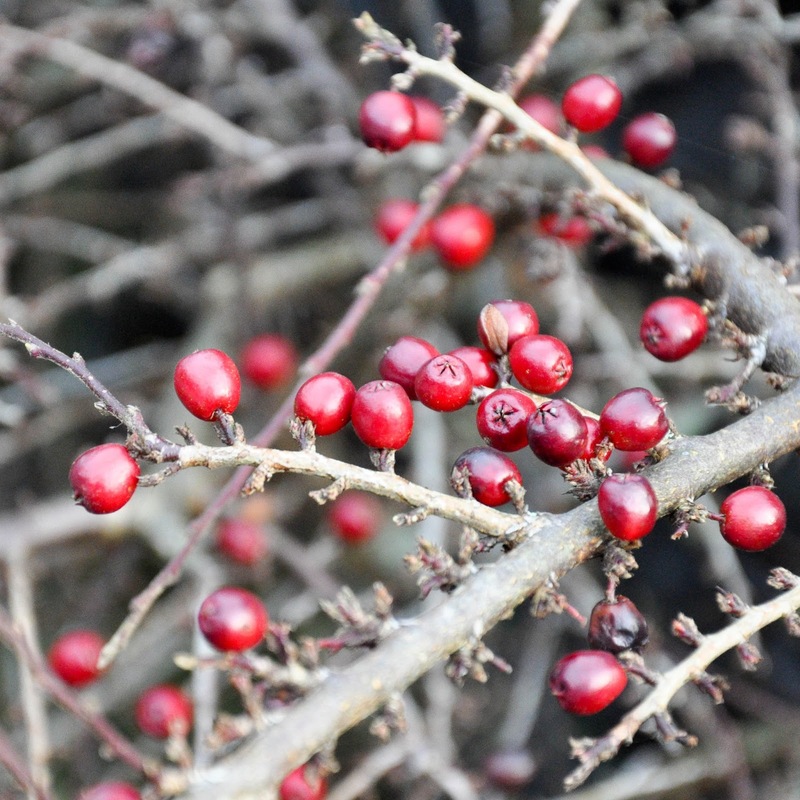 Little red clusters cuddle among naked branches or branches covered with glossy green leaves and remind me of old-fashioned festive cards. They hang over stone walls and above wooden fences, adding greatly to the Christmas feel. In the next couple of days I will share with you five more of my short stories to usher the New Year in. Let me know which one of those shared above appealed to you the most, as well as your own reflections and events which made Christmas 2015 unforgettable for you. Best wishes from me!